The dark side of the cell is the first concert of cellular audio. Listen to concert excerpts on the composition page. Read about the scientific background - "The singing cell" by Andrew Pelling or "Local Nanomechanical Motion of the Cell Wall of Saccharomyces cerevisiae" published in the SCIENCE Magazine. Much inspiration and many theories have arisen from the discovery of cellular audio. From esoteric to art historic, The dark side of the cell set off a wave of speculations. Whereas some interpret the oscillation of the cell as another proof of the ”vibrating universe” theory, others conclude that cell sound must be a part of a biological communication system. Science is discovering more and more evidence of a sounding universe, from noisy atoms to black hole sound waves. Whereas these findings may sometimes reveal insights into the functioning of matter, they mostly uncover more mystery. Cellular research, in particular, leads the attentive observer to more questions than answers. Why do some cells sound? We don’t know. Can we influence their behavior? Yes. In a society of rapid technological advances, the disproportion of human knowledge to technological power becomes disturbingly obvious. Nanotechnological tools have opened up a highly complex world yet to be discovered and understood, and, as has correctly been pointed out, the method of “trial and error” may not be an appropriate approach in this field. Raising ethical questions and emphasizing the drastic potential effects of bio- and nanotechnology on society is rightly a topic in contemporary art practice. The beauty of the mysterious contrasts with the manipulative power of the scientist. The sounds of the cells are indeed of astounding aesthetic and fascinating intensity, but the process of extracting these sounds is clinical and unemotional. In order to explore the behavior of cell motion and to produce different sounds, cells were exposed to disruptive liquids and life-impairing environments. Penetrating and ripping cells apart with the AFM tip is a less sophisticated but also effective way to create sound. Observing the slow death of a cell may well provoke thoughts of a philosophical nature, since it is life, admittedly a small and primitive life, but nevertheless life that we are manipulating. Where do we draw the line? The dark side of the cell has revealed a significant difference between scientific knowledge in western culture and mythological knowledge, since “singing cells” have long been part of the belief of non-western cultures, such as the indigenous of the Ecuadorian rainforest. The problematic relationship of scientific knowledge to technological power is the thematic focus of the dramaturgical progression of The dark side of the cell. 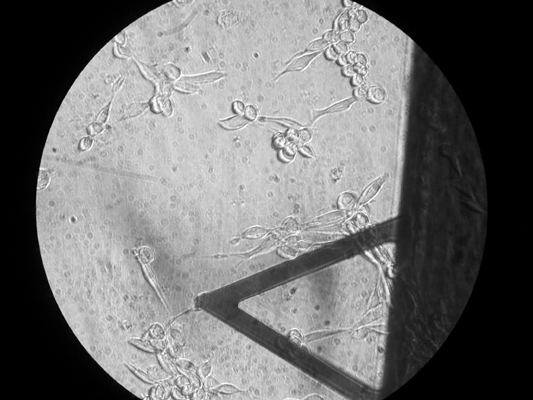 Optical microscope image of an AFM tip resting on top of a living NIH 3T3 Fibroblast cell.